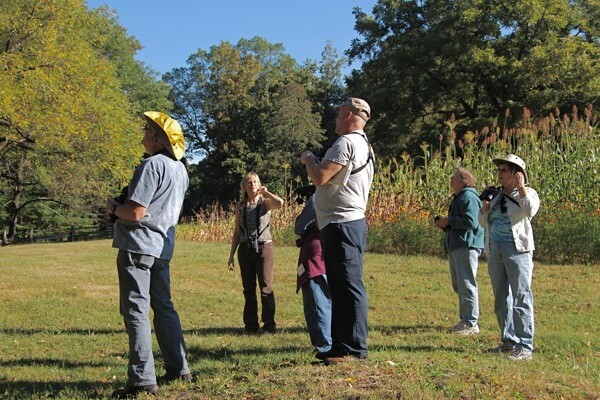 On Saturday October 30, Bruce Dorries and Crista Cabe led a tour of the Meadow Project at Mary Baldwin College, a long-term conservation endeavor. A small plot of land on the east slope of Cannon Hill is in the process of being restored to native grass, replacing the fescue grass that is commonly used in lawns. One of the principal benefits of this restoration is attracting songbirds to the campus, especially neotropical migrants, and some day possibly even Bobwhites. Bruce and Crista also showed the other areas on the MBC campus that will eventually be replanted with native grasses. They also answered questions about how the Augusta Bird Club can help in this project, and how residential home owners can convert their own yards to native grasses. Bruce Dorries and Crista Cabe led the tour at Mary Baldwin College. The first phase of the native grass restoration project at Mary Baldwin College. Photos by Andrew Clem. On Saturday, October 16, Andrew Clem led a field trip to the Chimney Hollow trail, on Route 250 in western Augusta County. The highlights of the morning were a Red-breasted Nuthatch, which was one of the main target birds, as well as a few Winter Wrens and Hermit Thrushes. Other birds of note included both kinds of Kinglets, a Blue headed Vireo, a Pine Warbler, a Blackpoll Warbler, some Pileated Woodpeckers and Hairy Woodpeckers, plus a Dark-eyed Junco. Afterwards, we stopped at the store in nearby West Augusta, where we saw 21 Wild Turkeys across the field, and then paid a brief visit to nearby Braley Pond, where we saw an American Coot. 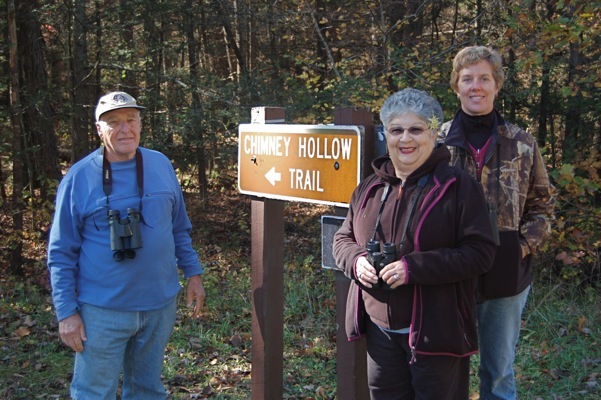 Grant Simmons, Jo King, and Tish Folsom at the Chimney Hollow trail head. Photo by Andrew Clem. On Saturday, October 9, Allen Larner led a very successful field trip to Augusta Springs, with several stops in the Swoope area on the way. Highlights included a Loggerhead Shrike, a third-year Bald Eagle, a Spotted Sandpiper, Northern Harriers, Purple Finches, both kinds of Kinglets, Rose-breasted Grosbeaks, Savannah Sparrows, White-throated Sparrows, a Blue headed Vireo, and five species of Warblers, including Nashville and Magnolia. It was a great mixture of "summer" and "winter" birds. 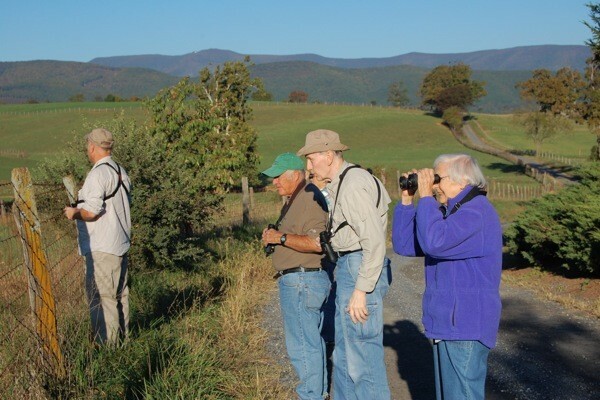 Augusta Bird Club members at Swoope on a fine fall morning. Photo by Andrew Clem. The Augusta Bald Eagles flew high and low during the Kiptopeke Challenge. It was hot and windy for the day, and we all as teams really had to look for the birds. At one point during the challenge the temps climbed higher than our species list. The biggest help to our team was scouting for two days and mapping out a route to follow. The biggest thing is being in the right place at the right time. But all in all after 17 hours in the field, we tallied 125 species for the day. Big misses for our team were Red-headed Woodpecker, Phoebe, Meadowlark, and of all things, that pesky House Finch that stayed out of view. The Kiptopeke Challenge is sponsored by the Coastal Virginia Wildlife Observatory. 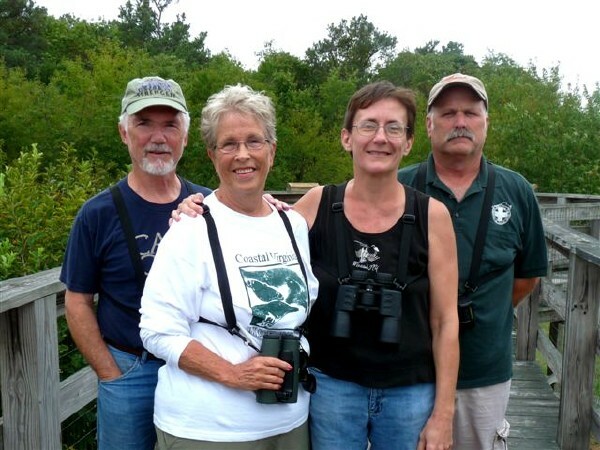 The Augusta Bald Eagles: Ed Lawler, Nancy Lawler, Jan Frye, and Allen Larner. 2010 marks the 75th anniversary of the Blue Ridge Parkway, and the National Park Service is celebrating the occasion by holding a series of special events at various locations. 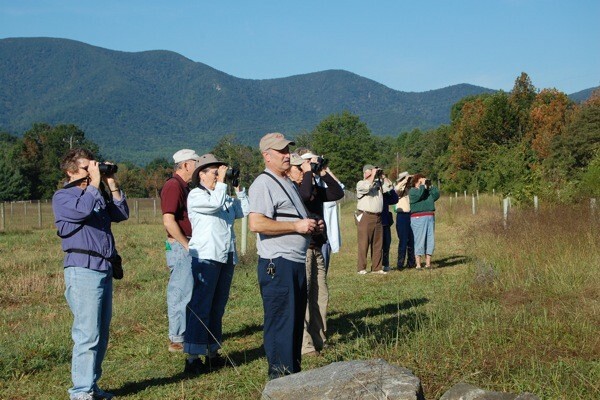 On Saturday and Sunday morning, September 18-19, Allen Larner led a bird walk open to the general public at the Humpback Rocks Visitor Center for the Park Service. The Saturday total was 23 species, and the Sunday total was 20 species, with Yellow-billed Cuckoos, Red-Eyed Vireos, and Scarlet Tanagers being seen both days. A large variety of warblers was seen, including Black-throated Blue Warbler, Chestnut-sided, Magnolia, Black-throated Green, Blackpoll, Black & White, American Redstart, Hooded, and two other species of Vireos: White-eyed, and Philadelphia, which are quite uncommon. There was also one flycatcher, an Eastern Wood Pewee. Allen Larner, Stark and Jean Smith, and others at the Humpback Rocks Visitors Center on September 19. Photo by Andrew Clem. On Saturday, September 11, 2010, eleven members of the Augusta Bird Club set out on the Rockfish Valley Trail early morning and we were joined a little bit later by Marshall Faintich and his two guests. We identified 33 species altogether, plus a "confusing fall warbler": possibly a Nashville, Connecticut, or Yellow Warbler. 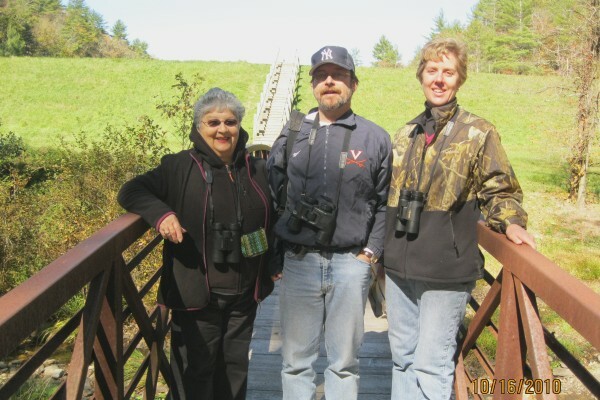 Augusta Bird Club members on the Rockfish Valley Trail. Photo by Andrew Clem. 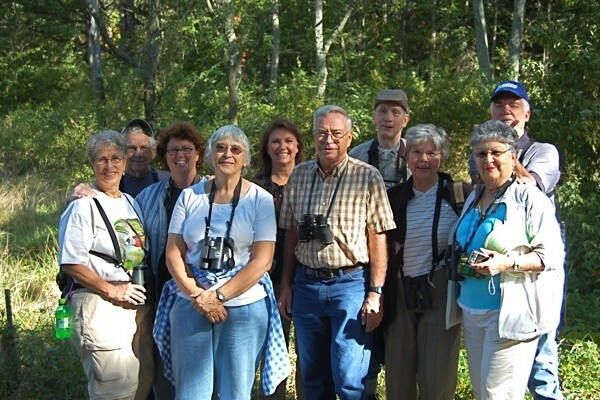 On September 15, 2010, eleven members of the Augusta Bird Club conducted a field trip to McCormick's Mill. We counted 35 species on a beautiful morning. One interesting observation was of a Cedar Waxwing going to the nest with food for young. We watched for about 20 minutes. It probably is not a record but a late one nevertheless. 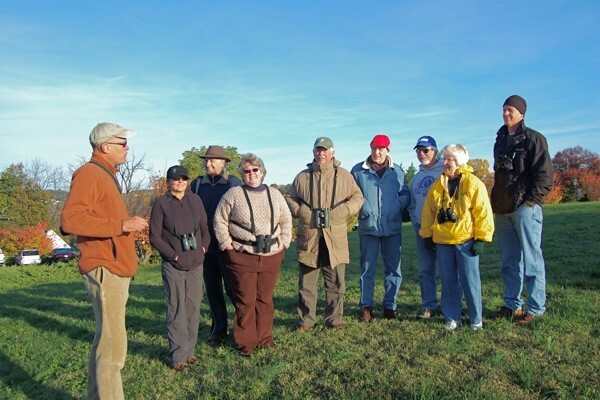 Augusta Bird Club members at McCormick's Mill. Photo by Andrew Clem. With very little warning, the Broad-Winged Hawks have begun their massive southward migration with quite a BANG! with 4,754 in total today! [September 15] The bulk of the flight occurred within a 4 hour period in the afternoon, summarized as follows: 8-11am (32), 11am-12pm (33), 12-1pm (56), 1-2pm (455), 2-3pm (1144), 3-4pm (1531), 4-5pm (1346), 5-6pm (157). Before the clouds appeared, extremely high birds were spotted which were barely visible in the clear blue sky even with a spotting scope. We suspect that a lot of birds passed over unseen because of this which may help explain lower numbers of birds reported to the north. Once the clouds came in, spotting became pretty easy. Most of the birds were streaming southward very high, pausing only a few times to form kettles. Maybe the winds were much stronger at that elevation. The entire afternoon sky was constantly full of Broad-Winged Hawks streaming over! Counters were constantly clicking away, and at several times two counters were clicking away at the same time in totally different parts of the sky just to keep up. Quite exhilarating! The following photo(s) may help people locate the Great Blue Heron rookery that was recently discovered on Sanger's Lane east of Staunton. (See the Birding locations page.) 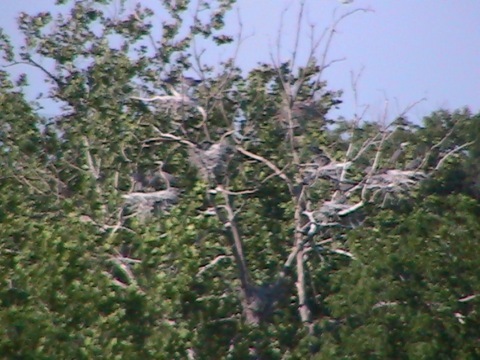 At least eight nests and several Great Blue Herons are visible in the zoomed-in photo below, taken from about a quarter mile away. 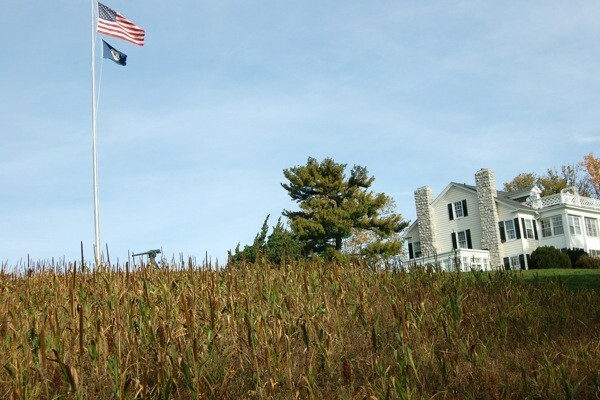 To see a broader view of the cornfield that lies between the tree and the road, just roll your mouse over the image. 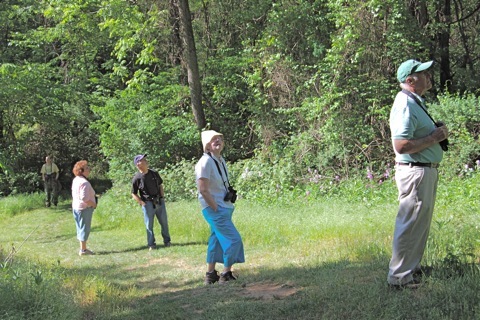 Grant Simmons (right) and other Augusta Bird Club members searching in vain for something interesting. Harry Lumadue, Robert (? 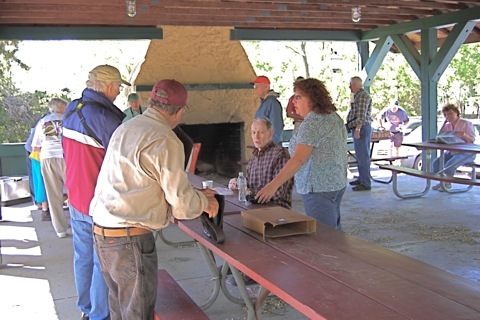 ), Dan Perkuchin, and Catherine Kohus were among those who attended this year's picnic. Brenda Tekin wants local birders to know that Natural Chimneys needs help in dealing with the large number of cats that are overrunning the area. The park is now under the management of the Augusta County Parks & Recreation Department, and they are hoping to get those cats out of there in time for camping season. Not being fed by park employees any more, the cats are hungry, and that means trouble for birds. Animal traps would be especially useful in rounding up the cats, which would be transported to the local SPCA. Anyone who is willing to loan a trap or help in other ways should contact Kathy McQuain at the Augusta County Government Center in Verona.